The Buzzer blog » Spot the Mark III – testing continues this weekend! Spot the Mark III – testing continues this weekend! Get ready transit fans because the Mark IIIs are almost here!!! This weekend you may see them being tested in regular service on the Expo and Millennium Lines. You won’t be able to actually ride the one, four-car test train just yet and there will be STAs on the trains at the doors just to make sure no eager beavers jump on. Think of the trains as pilots. They have to complete a certain amount of hours in a variety of different service situations and testing scenarios before they are given the green light to be used in service. We do this testing to ensure that the new trains are safe for all passengers and staff. 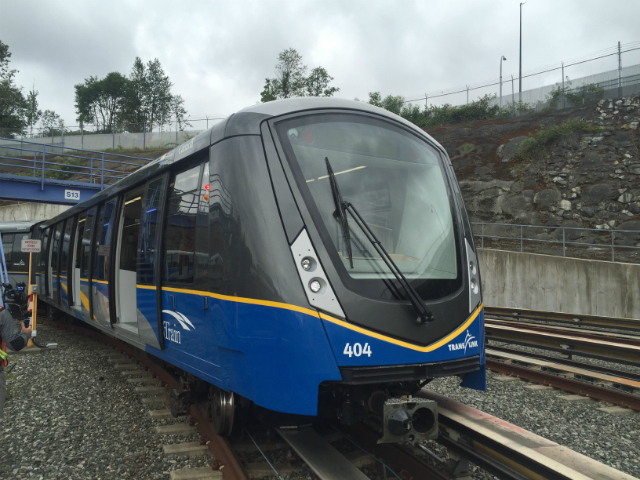 The third and final phase of testing allows actual SkyTrain passengers to ride the Mark IIIs when they are put into regular service. Stay tuned for details on that exciting day! What’s different about the Mark IIIs? The cars are all connected – meaning you can walk from one end to the other and move about freely within the train. These cars also have more room for standing passengers, wheelchairs, bikes, strollers and riders with luggage. Seats are an inch lower, which helps people like me whose feet dangle on the Mark IIs! They’re as quiet as a soft, summer’s breeze. OK, I’m taking some poetic license here but they are much quieter due to improved door seals. These trains are green. No, not the colour. They are more energy efficient! They have improved LED lighting and longer lasting battery system – lasting 25 years compared to the 10 year life span in our existing fleet. Snap a pic and share on Twitter and Instagram with the hashtag #SpottheMarkIII. Want a sneak peek inside the trains? Check out the gallery below. Chris Morris, Director, Engineering Assets at BCRTC showing off the Mark IIIs unique molton salt battery. I Love Transit: LEGO my SkyTrain! Come out and meet the Mark IIIs! If u dont want passengers to come on during testing, just program the trains to not stop at the stations? Hi Raymond! Ian is correct in saying that the trains do need to test in all situations and that includes door openings and closings at stations and the stopping and starting procedures as well. Thanks! @Raymond. If the trains didn’t stop in the stations and open their doors, that wouldn’t be much of a test, would it? The trains have to be tested in full simulation of regular service, which includes stopping, opening and closing the doors, and starting again.